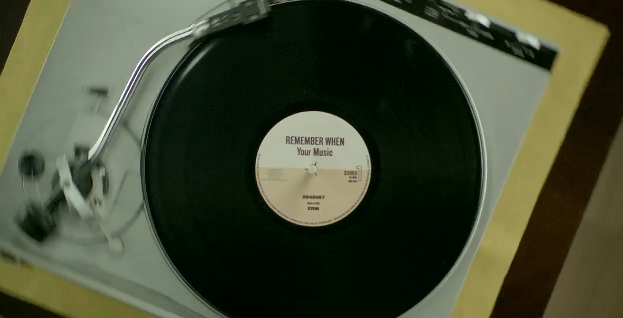 Google has today introduced its Google Music product for Android and the web at the “These Go to Eleven” event in Los Angeles. 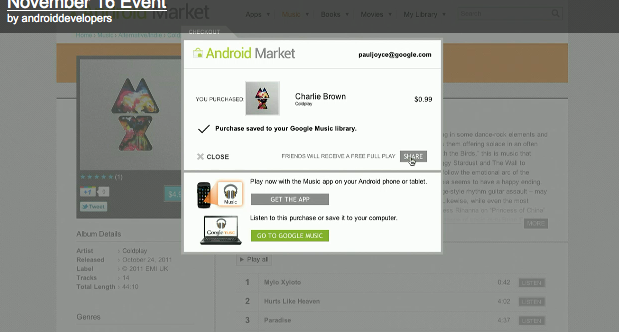 Google Music is going live for all users in the U.S. and will be free to use. Google says that it had an immense amount of interest in the beta version of the service, with 1 million testers listening to 2.5 hours of music a day. The app, which is available for any device from Android 2.2 and up, will allow you to stream your collection as well as “pin” music to the device, which will let you listen to it offline. 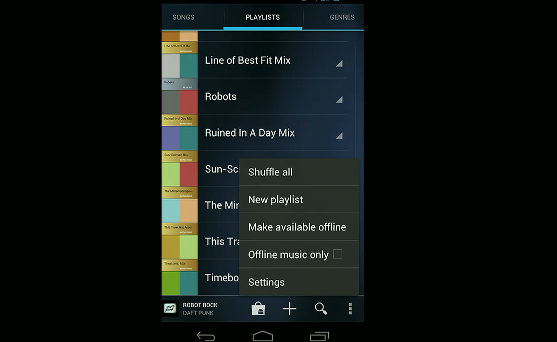 Google is adding music to the Android Market, where you can browse and buy from over a million tracks. Every song is a 320Kbps quality MP3, with a 90 second preview. Most cost around $0.99c. The app integrates sharing tools that you can use to discover music from your friends, and also to share with your friends or on Google+. Google has also updated its web interface to integrate with the new service, allowing you to listen to music, watch interviews and download free tracks, one of which Google will provide every week. There are more free songs available at launch to jump-start your collection as well. You can choose to share a song that you’ve purchased on Google+ from the web interface and the people you’ve shared it with can play the entire song right from inside their Google+ stream. This also works for entire albums. This is a crazy awesome feature. 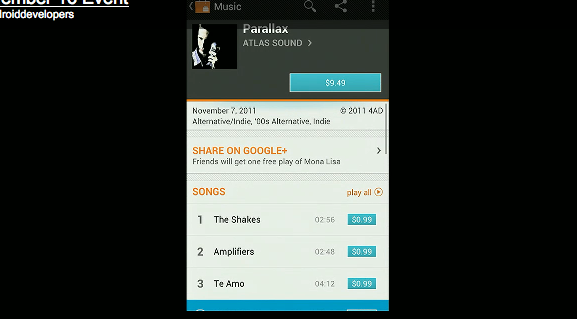 The Google Music service will also suggest songs to you as well as the ‘friend’ recommendation feature. Google’s Music partners include EMI, Universal, Sony Music Entertainment, as well as a bunch of smaller indie labels. 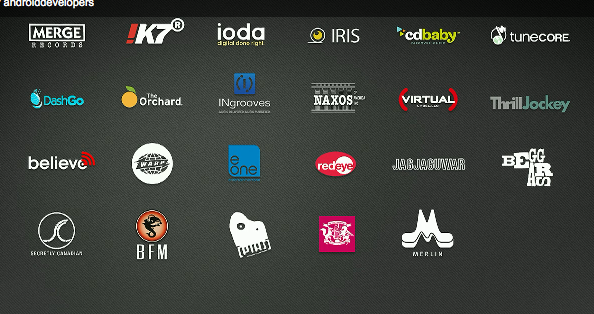 Over 1,000 partners total, which allows 13M tracks on the Android Market, 8M of which are live today. To promote the service, Google will be hosting exclusive concerts from The Rolling stones, an exclusive live EP from Coldplay and it would debut Busta Rhymes latest album. Google also announced its Artist Hub store, which will allow independent users to sell their own music on the Android Market. T-Mobile customers will also now be able to pay for music from the Android Market right on their phone bill, just as they do with apps.